Climate deniers beat Google and topped the page on searches for "climate change"
Google has long maintained that it must keep the workings of its search and ad-placement algorithms a secret, lest they provide a roadmap to the kinds of bad actors who'd like tweak the results and give their bad ideas (or sleazy products) pride of placement on its pages. This flies in the face of security best practices, which holds that there is no "security through obscurity" -- that keeping your security measures a secret won't prevent your adversaries from independently discovering their workings, but it will prevent the kind of peer review that is the gold standard in all post-Enlightenment knowledge creation. 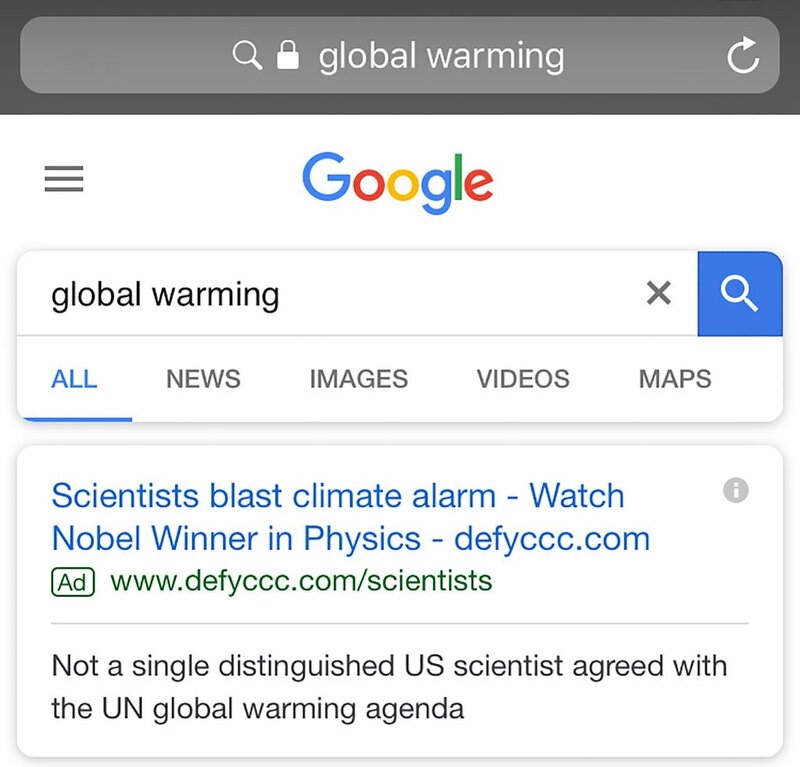 Throughout 2017, billionaire-backed climate deniers gamed Google's ad-placement network to put ads that defied the scientific consensus and sowed doubt at the top of searches for "climate change." These deniers have deep warchests thanks to the hydrocarbon barons who've invested heavily in denying the scientific consensus on climate change in order to eke out a few more billions before the world burns and they retreat to their luxury bunkers. In retrospect, it's easy to see how this could happen. The people promoting the scientific consensus on climate are devoted to making web-pages and other information resources on the looming crisis. The people denying the consensus are devoted to figuring out how Google works and defeating its countermeasures. Because one group is devoted to climate and the other is devoted to tricking Google, even small insights gained by the latter team will translate into huge gains in the search results. (Google has long maintained that people who want to be highly ranked on its pages should focus on "making good sites," not figuring out Google's ranking systems). This problem is exacerbated by Google's shortsighted policies, which ban "deceptive advertising" but limit the definition of "deceptive" to lies about product pricing and other narrow matters, meaning that climate change denial is permitted under the rules.